Dubai has become synonymous with luxury and glamour. If you’re looking for the holiday of a lifetime, Dubai is the location you should consider. There are premium shopping facilities, unrivalled unspoilt beaches and endless activities for individuals and families to enjoy. The term ‘luxury’ gets thrown around quite loosely in the holiday industry to describe what in essence should be fairly standard, Dubai offers unforgettable luxury holidays without even having to leave your hotel room. It’s the personification of luxury. So, if you’re thinking of going on holiday and have Dubai in mind, let’s whisk you away on an imaginary journey as we explore the finest hotels in Dubai. 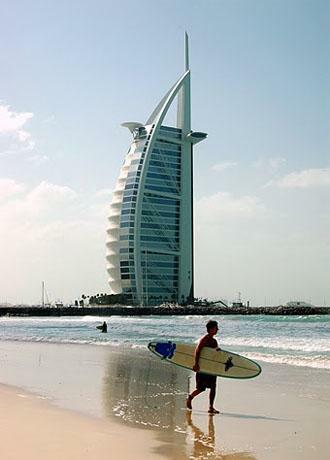 The Jumeirah Beach Hotel opened in 1997 and has been wow-ing Dubai holiday goers ever since. The hotel offers 598 obscenely lavish rooms and effortlessly accommodates an additional 19 luxury villas. Keeping true to its name, the Jumeirah Beach Hotel offers exclusive visitor access to over 364,000 square foot of Dubai coastline. If ever guests make the bizarre decision to leave the hotel, they have unlimited free access to its water park neighbour ‘The Wild Wadi Water Park’. The hotel certainly makes an impression, rising on the coastline like a huge mechanical wave glistening in the Dubai sun. Architectural beauty and one of the many reasons a large number of us now consider booking the Jumeirah Beach Hotel for our luxury holidays. Scared of heights? Maybe give this luxury cloud buster a miss. Burj Al Arab is the fourth tallest hotel in the world and is situated on the artificial island of Jumeirah. There is truly no expense spared in this hotel – even the elevators are gold plated! There is nowhere better for exclusivity as you are only allowed on the island if you have a reservation at the hotel and are only allowed access to the private beach if you have reserved a room at the hotel. The Al Mahara restaurant inside the hotel is notorious for its aquarium which adorns the centre of the room. The Burj Al Aarab is often described as the world’s only seven star hotel, and with rooms costing up to $27,000 a night, you can understand why. Atlantis: The Palm has only been open since September 2008 but it certainly announced its arrival in style. The opening party featured the who’s who of celebrities from around the world, over 100,000 fireworks (which is seven times the amount used in the 2008 Beijing Olympics opening ceremony) and cost a cool $16million in total. So the hotel must be pretty amazing, right?! Yup. With over 1500 rooms, its own Aquaventure waterpark, 20,000 square foot of retail space and its exclusive dolphin bay, it’s EVERYTHING a luxury holiday should be. Want to experience luxury accommodation at its finest? Opt for the Bridge Suite which will set you back a hefty $25,000 a night. Cocktail lovers might affectionately know that Raffles started in Singapore and it is the birthplace of Singapore sling cocktail. Inspired by Egyptian architecture, Raffles of Dubai is quite simply an impressive modern day pyramid which is packed with premium perks. The striking exterior is matched by its incredibly beautiful interior and it’s even more glorious Botanical Garden which covers an area of over one hectare! The garden features four areas which represent Water, Air Fire and Earth and assemble together on a glass dome which reflect the Eye of Horus who is the Egyptian God of the Sky. The garden is host to over 129,000 species of plant and trees. If you’re really looking to pamper yourself, try unwinding by experiencing the Egyptian Gold 24 karat gold facial treatment in the hotel’s spa. Kempinksi Hotel Mall of the Emirates is famous for its deluxe interior and the attraction of its popular indoor ski slope. The hotel opened in April 2006 and was built attached to one of the largest shopping malls in the world, so if you love a little retail therapy this is ideal! The hotel features 393 rooms of which 15 indoor chalets look over the indoor ski slope. All rooms feature high end mod cons including a plasma TV and high speed Wi Fi. Those looking for the very best luxury lifestyle can stay in the hotel’s one and only Presidential Suite which comes covers three hundred square metres and even boasts a maid’s room! Scott Cole the author of the “Ultimate luxury holidays – Dubai’s top 5 hotels” is an avid traveller and writer who wishes he only had more time to go on luxury holidays!